If you want to conceive, you need to find out when are your fertile days; luckily, this free ovulation calculator is here to help you! In just a few clicks, you will be able to assess when you are ovulating over the next three cycles. 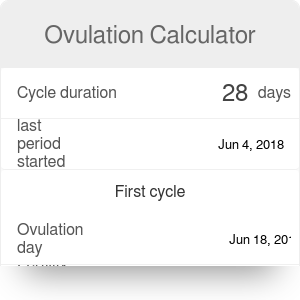 You can use this ovulation tracker not only to maximize your chances of getting pregnant, but also to estimate your due date. Ovulation is the release of an egg from one of your ovaries. It typically occurs around two weeks before the beginning of your period, in the middle of the menstrual cycle. You are the most fertile around the time of your ovulation - to be more precise, during the so-called fertile window. It starts seven days before your ovulation day, as sperm is able to survive up to seven days in your body. Since the egg is less has a shorter lifespan, the fertile window ends 24 hours after the ovulation. Your cycle duration. The typical cycle lasts for around 28 days. However, it is perfectly normal to have a cycle that is a bit longer or a bit shorter, for example lasting 27 or 30 days. If you're not sure what is your cycle duration (or you menstruate irregularly), stick to the default duration of 28 days. Last period started on... The other piece of information this ovulation tracker needs is the date when your last period began. As mentioned before, you ovulate in the middle of your menstrual cycle - that is, around two weeks before your next period. If you want to find out a more precise date, you can always try charting your body temperature or checking your cervical mucus. The fertile window starts seven days before the ovulation date and ends one day after it. For example, let's assume your last period began on May 26th, and your cycle lasts for 30 days. If you're trying to get pregnant, your most fertile days in June will be 4th to 12th. Our ovulation tracker displays the fertility windows for the next three cycles. It means that if you miss the fertility window in June, you can try to conceive between 4th and 12th of July or between the 3rd and 11th of August. The last feature of this ovulation calculator is the estimation of the due date - that is, when your baby will be born if you conceive. We assume that the pregnancy lasts 280 days (40 weeks), but you should be aware that only five percent of all women deliver on their due date. Your child might be born a bit earlier or later. For example, if you conceived during the fertile window of June 4th to 12th, then you can expect your baby around the middle of March. In the meantime, make sure to take a look at the pregnancy weight gain calculator! Ovulation Calculator can be embedded on your website to enrich the content you wrote and make it easier for your visitors to understand your message.